Clyde Mitchell Shoun Nickname Hardrock. Born March 20, 1915 in Mountain City, Tenn., and still resides there. Scotch-Irish descent. Started pro career in Birmingham of the Southern League in 1935. Pitched in 53 games, all incomplete, in 1939 with the St. Louis Cardinals. 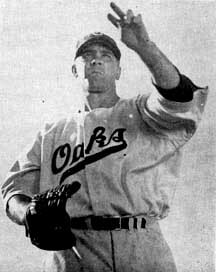 Hurled a 1-0 no-hitter against the Boston Braves May 15, 1944, and save for a base on balls to his pitch- ing rival, Jim Tobin, in the third inning he would have had a perfect game. Tied for league lead in winning percentage among pitchers with 15 or more decisions in 1943. 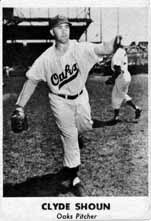 Brought to Oakland in 1950, left handed hurler Clyde played for Indianapolis in 1949, where he pitched 20 innings in 10 games, striking out 6 batters while giving up 10 walks, and chalking up 1 win and 1 loss. (c) Copyright William B. Shubb, 2000.